There are three types of kurtosis which is a description of the "peakedness" or "flatness" of the probability distribution curve relative to the bell curve of a normal distribution. This does not have to do with skewness. 1) Platykurtic - negative kurtosis value that indicates flatter distribution that normal bell curve. The lower the value the flatter the distribution with more spread. An example is the Uniform Distribution which has a kurtosis = -1.2. 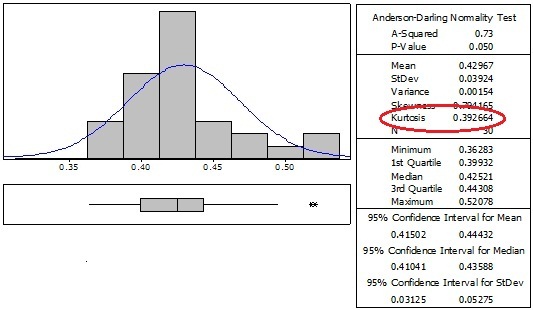 2) Leptokurtic - positive kurtosis value that indicates peaked shaped distribution compared to normal bell curve. The higher the value the sharper the peak the distribution and less spread. An example is the Double Exponential Distribution which has a kurtosis = 3. 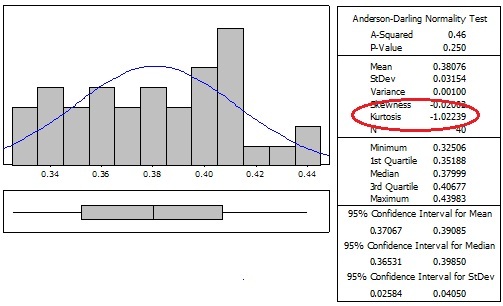 3) Mesokurtic - when kurtosis value = 0 . A normal distribution has a kurtosis value of zero. It is in between the first two types. The formula for calculating kurtosis is shown below with an example. The sample size must be a least four. 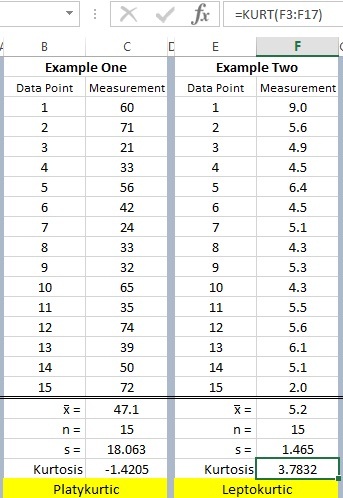 There are two sets of data shown with 15 samples each. The calculations are shown with the kurtosis value for each set. The formula in Excel is shown in the upper right.